Team Europe’s record-breaking 2016 Weber Cup squad will be back in its entirety for this year’s transatlantic tenpin tussle, which returns to its familiar Barnsley Metrodome home from September 8-10, with tickets on sale now. England’s Dominic Barrett returns as captain with compatriot Stuart Williams making his seventh appearance in the Europe vs. USA showdown. Sweden’s Martin Larsen is unbeaten in five Weber Cups and the team is completed by Jesper Svensson, who’s incredible debut in the Cup helped lead him to be crowned Rookie Sportsman of the Year in front of millions of TV viewers at the annual Swedish Sports Gala. Europe won the Weber Cup for a record fourth consecutive time last summer, beating Team USA 19-11 in Manchester and now have their sights on taking home the trophy for a tenth time. L-R Jesper Svensson, Dominic Barrett, Stuart Williams and Martin Larsen. “It’s an honour to be captain again,” said Barrett. 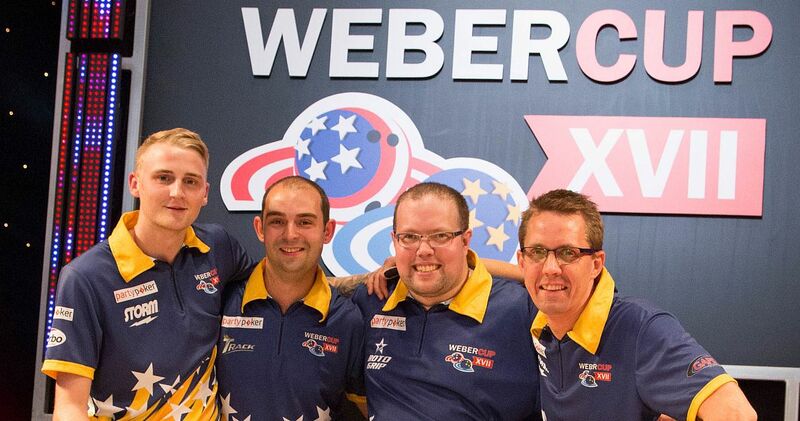 “The Weber Cup is the highlight of the year, not just for myself but for the whole team. It’s not often we all get to compete as a team and share that experience together. We’ve had some really good years and we look forward to keeping the momentum going. Williams said: “I am so excited to be heading back to Barnsley, the home of the Weber Cup. I have so many great memories of winning in Barnsley, especially the baker game final match win in 2014. Larsen added: “To get the honour to represent Europe in the Weber Cup for the first time in 2009 was a dream come true for me. That I will now bowl my sixth Weber Cup feels unbelievable. “Europe has many great bowlers but very few get this chance. Everyone that has ever been on that Weber Cup lane knows what I mean when I say that’s THE lane to bowl on. I am looking forward to feeling the magic atmosphere again in September! The American team for Weber Cup XVIII will be announced shortly. This year’s event takes place from Friday 8th to Sunday 10th September as the Weber Cup pits Europe’s best against their American counterparts over three days and five sessions of high-octane action. For the first-time fans will be able to select their seats when purchasing tickets – allowing those who book early access to the best seats in the house.